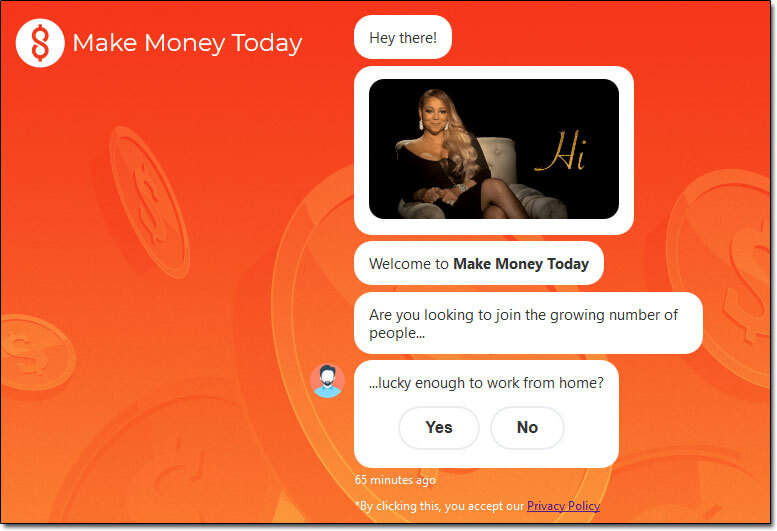 The creator (who remains anonymous) states that it’s super easy & that anybody can simply plug-in & start making money… But is it really legit & can you truly make money with the Auto Chat Profits robot or is it a scam that’ll just part you with your hard earned cash instead? 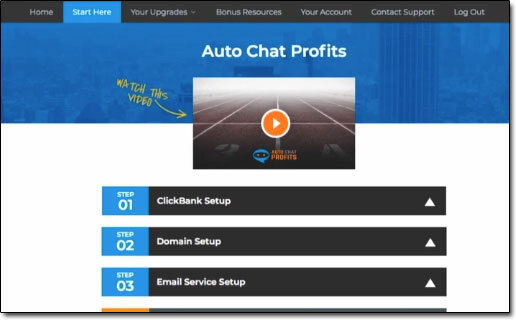 What Exactly Is Auto Chat Profits? And according to the website it won’t just generate you “any” money, it’ll supposedly generate you whopping consistent profits of up to $423.67 per day – or at least that’s what its creator claims anyway… However weirdly the creator remains completely anonymous. The only name mentioned on the website is that of Samantha Smith, the video spokesperson, but upon scrolling right down to the bottom of the Auto Chat Profits website I read in the disclaimer that “The spokesperson used in the video is using a pen name“… So there’s really no trace of who’s actually behind all this. Though in the same breath with that being said I don’t advise rushing right into buying the Auto Chat Profits program because whilst there is some substance to it there are also some big problems – and it’s also unlikely that you’ll earn anywhere near the amounts advertised… In fact you could (and likely will) just end up spending more through the program than you ever actually manage to make back. Essentially the concept here is that in return for $37 the creators of the Auto Chat Profits program are going to set you up with a “done-for-you” website that will contain a robot chat feature designed to generate affiliate sales on your behalf. So the first step after signing up to the program will be for you to register with an affiliate network named ClickBank – and this is where one of the initial problems with the software lies. The reason I say that is because whilst ClickBank itself is legit, most of the products found on the ClickBank network are borderline (or outright) scams & these are the things you’ll be forced to promote via your “done-for-you” website. Some example ClickBank scams include the likes of Paid Social Media Jobs & Instant Email Empire which I recently exposed. Then once you’ve created your ClickBank account & integrated it with the Auto Chat Profits system the next step will be for you to select a domain name that you’d like to use & this is where problem number 2 lies. They claim the domain name is included with the cost of your membership however you’re forced to use one of the ones they’ve already preregistered (meaning you can’t pick your own) & also you never actually own the domain name yourself – the creator of Auto Chat Profits keeps the ownership of it. Anyway after that the next step is to sign up with an email marketing service like AWeber or GetResponse. The reason for this is because you’ll be collecting emails from people through the website they create for you & you’ll be using these email marketing services to follow up with people in an effort to convince them to buy one of the affiliate products (so that you actually earn a commission). Now I can tell you that even as an online marketing expert it is extremely difficult to come up with a profitable paid advertising campaign & I’ve seen many big names burn through tens of thousands of dollars before turning so much as a single dollar in profit… I’ve even seen some spend just as much and NEVER manage to turn a profit. It’s a real risky game, especially if you’re now – and what’s even worse is that the Auto Chat Profits training puts a focus on a method of paid advertising known as solo ads which is one of the most riskiest methods there is. So whilst the chat bot itself is kinda cool, the rest of it isn’t – and as a result the chances of you actually making money with this thing (despite there actually being some substance behind it) are still slim to none. …and I think that with that in mind it’s now quite clear why the owners have chosen to keep themselves hidden. After doing some research though I was able to find out that the creators of this program are the same people who were behind the Five Minute Profit Sites scam as well as the Profit With Alex scam. I was able to find that out by visiting their own affiliate page on ClickBank – and it was here that I also discovered that the $37 fee that is advertised all over their website isn’t really the trust cost of the program. For a mere $37 you might be thinking “what the heck, I’ll try it out & see if it works” but that’s exactly what the creators want you to think as after visiting the affiliate page I discovered that the $37 is basically just an entry-fee. On the sales page you’re told that you get a done-for-you website & a domain name, but the truth is you don’t really get either of these – at least not to keep anyway, the creator of Auto Chat Profits keeps them instead. This means that if you do end up making money (which the chances of doing so are super slim) then the creator of Auto Chat Profits still owns everything you have so he could just re-route the profits to himself…. Or if Auto Chat Profits closes, so will your site – and so will your profits. You’ll be left with nothing! My Verdict – Is Auto Chat Profits a Scam? I’m not gonna lie, in this instance this is a pretty difficult question to answer – I mean the claims are extremely hyped up & the as far as I’m concerned the chances of you actually making money with this thing are really slim, but at the same time you do technically get something that could technically make you money on the other side. So my verdict here is going to be that no, it’s not really a scam as such – but in the same breath it is going to be unlikely to actually help you make money. I think the only people who’ll find themselves making any money through this are those who are already experts in paid advertising & have a huge budget behind them to test the traffic. 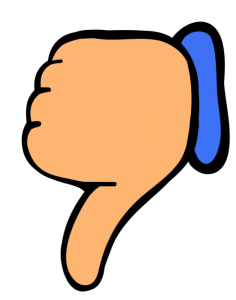 Even then I wouldn’t really recommend the program though and I say that for 2 reasons – firstly because the creator keeps ownership of everything (meaning your site could get closed at any moment) and secondly because 99% of the things the chat robot recommends to people are scams from ClickBank like Paid Social Media Jobs & Insta Profit Hack. If you truly want to make good money online then you should steer clear of hyped-up gimmicks like the Auto Chat Profits because even if they did work they are simply not sustainable. Instead you should just join a proven & legitimate place like Wealthy Affiliate where you’ll learn how to create your OWN business that will generate you money for the long term.